The Rebel Sweetheart. 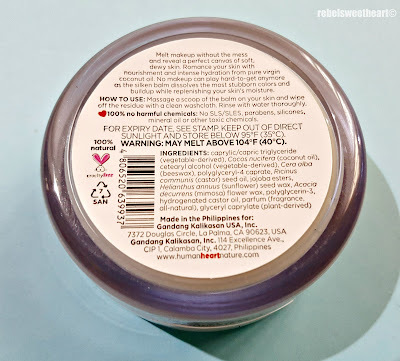 : Spotlight | Human Heart Nature Bare Necessity Cleansing Balm. Spotlight | Human Heart Nature Bare Necessity Cleansing Balm. Cleansing is the most basic step of any skincare routine. For me, it's cleansing twice in the evening - after an entire day of wearing makeup and spending the most part outdoors, exposed to dust, dirt, and pollution. Double cleansing starts off with a cleansing oil or micellar water to break down the makeup, sunscreen, and excess oil on the surface of the skin, followed by a water-based cleanser for a deeper, thorough cleansing. 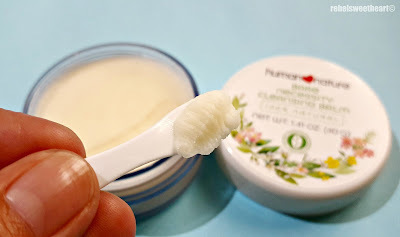 This has been part of my bedtime routine for years now, and I must say, double cleansing plays a huge part in keeping my skin smooth and 'pore-less' (save for the days before and during my monthly period). 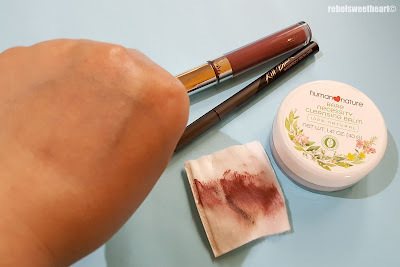 Now if you're the type who finds it too much a bother to cleanse your face twice, or have ultra-sensitive skin and fear that double cleansing might 'over-wash' your skin, then this product is right up your alley. 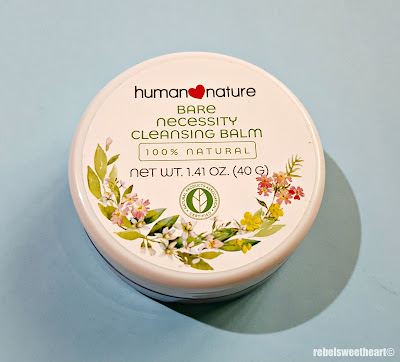 Human Heart Nature Bare Necessity Cleansing Balm. 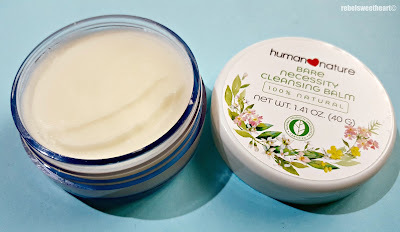 Human Heart Nature recently launched an array of new skincare products, which includes the Bare Necessity Cleansing Balm. 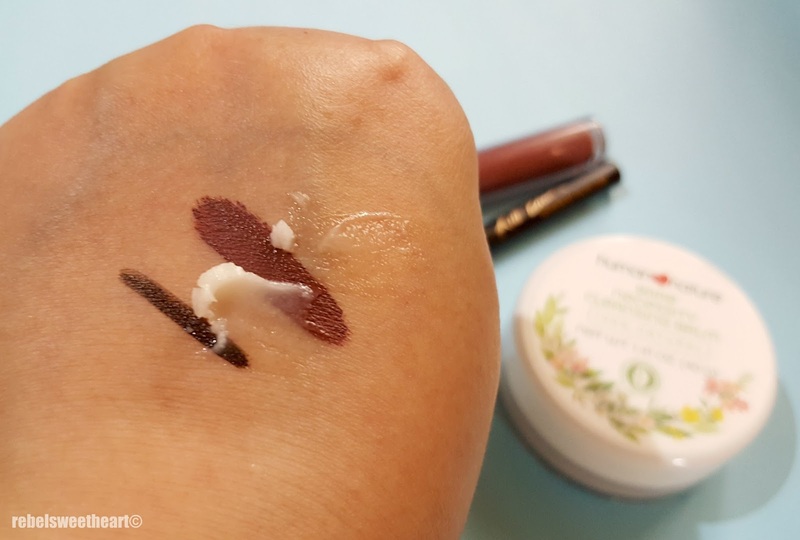 It's a solid balm that liquefies upon contact with the skin and melts away dirt, residue, and even long-wearing, waterproof makeup. Product details at the bottom of the tub. If you're familiar with Banila Co's Clean it Zero (aka the holy grail of cleansing balms and the first step of my double cleansing routine), you'll be glad to know that this product does pretty much the same thing - at half the price AND sans the mineral oil. Comes with a small spatula. The Bare Necessity Cleansing Balm is made with pure virgin coconut oil which easily breaks down waterproof eye makeup and even long-wearing matte lipsticks. It doesn't strip the skin of its natural moisture. Instead, it nourishes and hydrates the skin as you cleanse, making it a softer and smoother canvas for the rest of your skincare routine. 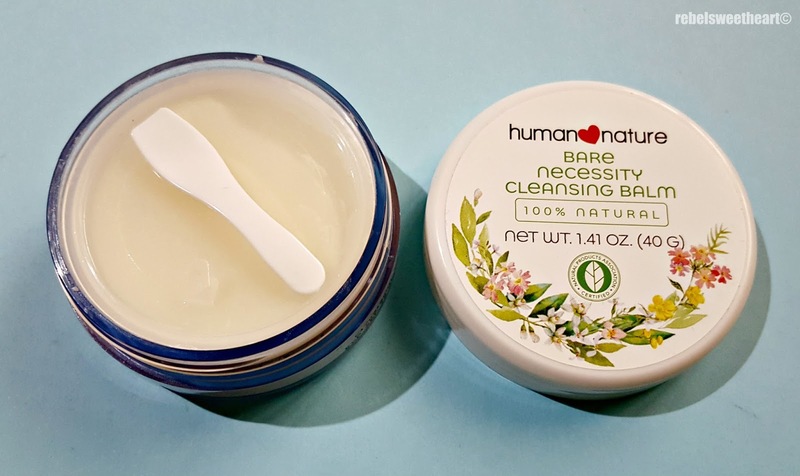 This cleansing balm also contains castor seed oil, known for its anti-aging and anti-inflammatory effects; sunflower seed wax, which is rich in nutrients and anti-oxidants; and mimosa flower wax which soothes the skin, makes the complexion glow, and gives this product a sweet, warm, and powdery scent. To use, simply scoop a small amount of the balm using the tiny spatula that comes with the tub. Apply it on the skin and gently massage it on your face to remove your makeup. and Colourpop Ultra Matte Lip in TooLips. 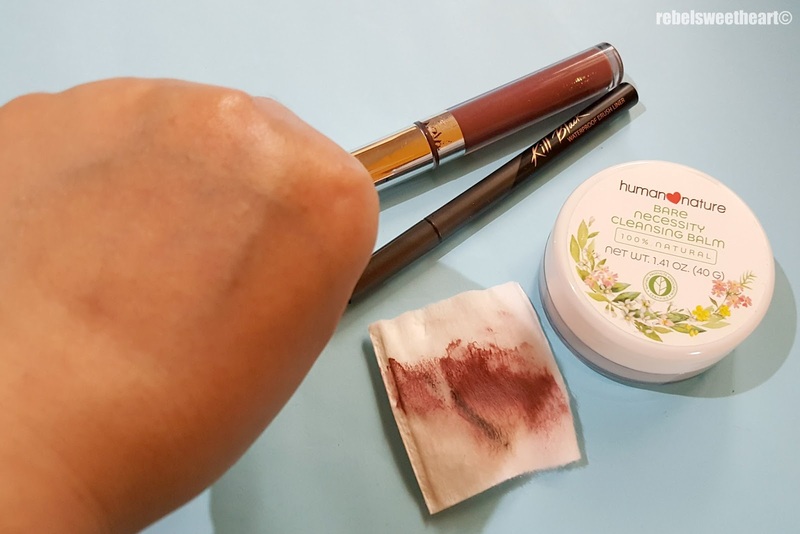 As the product melts away your makeup, it also breaks down into a silky oil which you can wipe off with a cotton pad and rinse with just water. A small scoop on the back of my hand. The balm emulsifies as you rinse and leaves the skin with a soft, milky feeling like a cleansing oil would. However, it does not add any excess oil nor does it make your skin look like a greased pan. 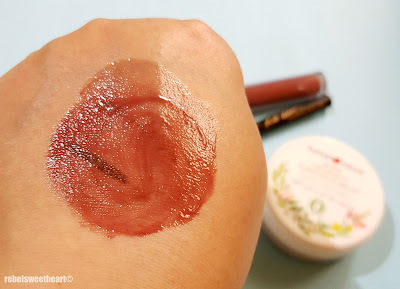 I love how this balm removes makeup in a jiffy. 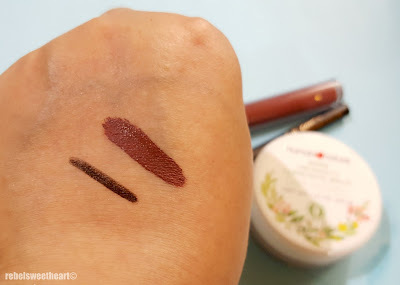 Even Clio's Salon de Cara - one of the most resilient mascaras that I have used to date - melted away in seconds with this cleansing balm, making this whole makeup removing/cleansing process a lot easier for me. Sure, I still rinse my face with a water-based cleanser afterwards, but there was this one time that I was too dead-tired to go through the entire ten-step skincare routine that I hit the sack as soon as I removed all that gunk off my face. Thankfully, my face did not suffer from breakouts or irritation, nor did it feel dry or flaky the morning after. Another thing that I love about this product - aside from the fact that it's made with all-natural ingredients - is its travel-friendly, no-spill solid formula. I can easily slip this into my carry-on without having to worry about the size (each tub weighs 40 grams), or liquid spills in my luggage. The Human Heart Nature Bare Necessity Cleansing Balm retails at Php 345 per tub and is available at the Human Heart Nature online store and Human Heart Nature branches nationwide. such elegant ingredients in this product! I am religious about my skincare routine, and I think this would be a great addition. That's pretty awesome! I just love how quickly it takes effect. It's perfect for people who wear make-up often. It will help take better care of their skin! Looks like a great product I do not wear a lot of make up but I like a cream that can remove what i wear easily. This product looks so interesting. I like it because it can remove dirt and excess makeup. Perfect cleansing balm for our skin care regimen. I didn't know Human Nature had these. I will definitely give it a try. I'm trying to double cleanse now too. I've recently read somewhere that it's a great practice.